Brisket Can Save Your Life!?! Looks like people in Texas could outlive the rest of the country because of their precious Brisket. I may not be from Texas, but I am really hoping this reasearch is true. If it was perfected in Texas, you can bet someone from this state is proving it’s good for you. Such is the case for brisket and ground beef! Researchers out of Texas A&M have found that not only does it make for some of the tastiest food you’ll ever try, but (believe it or not) it comes with some health benefits too. 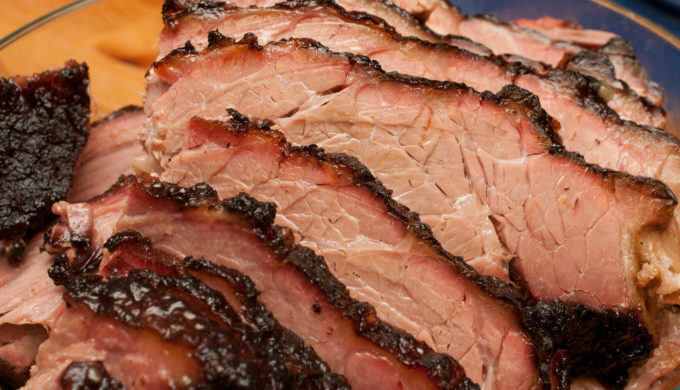 Their findings confirmed that high levels of oleic acid can be had in beef brisket. You want this because it lowers LDLs (the “bad” kind of cholesterol,) and produces high levels of HDLs (the good kind, which are said to promote better heart health). Dr. Stephen Smith, a research scientist from Texas A&M AgriLife Research, explained the findings. “Brisket has higher oleic acid than the flank or plate, which are the trims typically used to produce ground beef,” he said. “The fat in brisket also has a low melting point, that’s why the brisket is so juicy.” Researchers in this study have also found that the same applies to ground beef, but to a lesser degree. America loves beef, and that love runs especially deep in the Lone Star State. Brisket is now one of the preferred trims in the production of ground beef. That’s good news, considering Americans eat 50% of our beef in the form of ground beef, and it’s featured in a huge number of recipes. In the production of ground beef, 25% of the carcass is used. This, Smith explained to AgriLife Today, “improves the sustainability of beef production.” Smith also noted, “Our studies have shown that fat is a very important component of beef.” The details of the study show that the good cholesterol (or HDL) increased in those who ate beef that was high in oleic acid. It’s something to celebrate as you prepare for the best season of the year… barbecue season. While our Beef Feast may not be traditional biltong, it borrows the spices and curing process from a long and treasured South African practice. Below you can check out the Wikipedia page on biltong. While our tender and savory meat is a derivative of South African biltong, we have developed a new process and different flavors that are more suited to the American palette. We still have South Africans tell us how amazing our freshly prepared beef reminds them of their home country, so we haven’t lost the essence of high-quality biltong. Of course in the US we have beef jerky, but Beef Feast has a much more savory flavor and softer texture. It is more like eating steak than the leathery beef jerky. Beef Feast is Higher in Protein, while being lower in sodium, and having no sugar. Whether you are trying to build muscle, find a healthy snack, or just love savory beef, you need to try Beef Feast today!